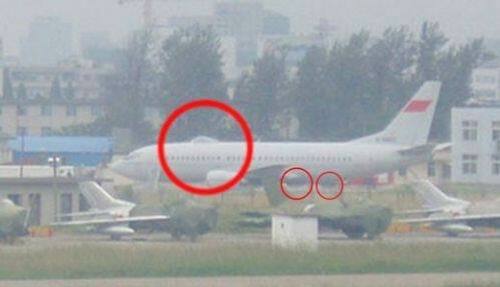 May 23, 2010: A photo of a Chinese Air Force Boeing 737, equipped as a reconnaissance aircraft, recently appeared on a Chinese blog. Such a conversion has been rumored for over a year. This particular use of the 737 is illegal, as China gets the 737 from American manufacturers with the understanding that they will not be converted to military use. But Chinese air force officials have concluded that, for AWACS and maritime reconnaissance work, the 54 ton propeller driven Y8 (which is based on the Russian An-12) and Y-7, and 157 ton IL-76 jet, are not reliable enough, and more expensive to maintain, than the twin engine, 79 ton, Boeing 737-800. Chinese airlines (some of them controlled by the Chinese Air Force) have been using the 737-800 since 1999 (a year after this model entered service). Currently, China is equipping its 21 ton, twin engine, Y-7 transport with a phased array radar similar to that used on the larger KJ200 AWACS. The Y-7 is a Chinese copy of the Russian An-24. The Y-7 AWACS would be similar to the U.S. 23 ton E-2 that operates off carriers. But China still has problems producing a reliable and effective large radar aircraft. Four years ago, the Chinese Air Force realized it was not happy with its first four IL-76 AWACS (A-50s from Russia, converted to use Chinese KJ2000 radar systems). This led to a smaller system carried in the Chinese made Y8 aircraft (as the KJ200). Eventually, the Chinese began outfitting a Boeing 737-800 airliner as an AWACS aircraft. There may be as many as three of the 737 AWACS in service already. These work much better. The Y-7 is thought to be a version that could operate off China's coming fleet of aircraft carriers. But the Y-7 is also cheaper, and better suited for equipping more air force units with AWACS capability. The KJ200 entered service two years ago, and export versions sell for about $145 million each. China has had to develop its own phased array radar for it. The Y8 based KJ200 carries a flight crew of five and a mission (AWACS) crew of about a dozen. The aircraft can stay airborne for about seven hours per sortie. The KJ2000 radar has a range of about 300 kilometers, and the computer systems are supposed to be able to handle 5-10 fighters at a time, and keep track of several dozen enemy targets. There are several Western adaptations of the 737 to be military radar aircraft. This includes the U.S. Navy P-8A, a maritime reconnaissance aircraft. This is not supposed to include Chinese conversions. When China is confronted about their militarized 737s, they will most likely deny it all, and dare their accusers to do something about it. That approach has worked so far.